From the glitz and glam of the red carpet to a zombie apocalypse, Hollywood can deliver just about anything—anything except authentic military personnel, equipment or locales. If the script calls for an F/A-18 Super Hornet to battle invading aliens, that’s a big no-go unless Philip Strub gives his stamp of approval. For documentaries, it’s David Evans who needs convincing. Strub and Evans comprise the Pentagon’s Entertainment Media office. Their role is to bless or deny filmmakers’ requests to incorporate the real-deal military into feature films and help documentarians complete their projects. Though certain criteria must be met, it’s rarely a cut-and-dry decision. 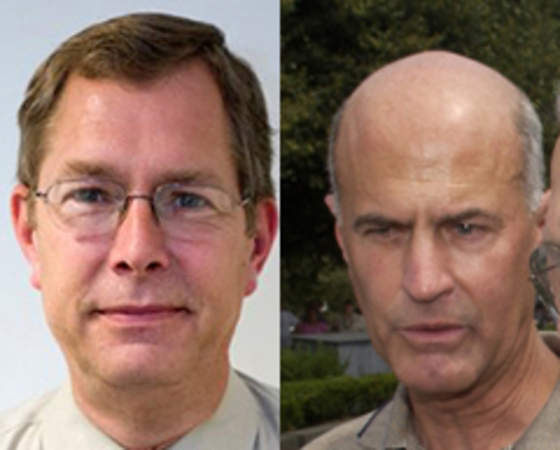 Pentagon’s Entertainment Media officials Phil Strub, right, and Dave Evans approve or deny filmmakers’ requests to incorporate the military into films, TV shows and documentaries. On the feature film side of the house, the process starts with the script. Strub said on the rare occasion when he receives an “absolutely hopeless” script presenting an implausible military premise, he might send it to the services’ entertainment liaison officers. “Although, I’ve thought that about some scripts and we’ve wound up working on them, so I’m not too quick at condemning them,” he said. “I might tell the services, ‘Hey, I just said no thanks. You want to read the script, let me know.’ And they might do the same thing. Part of a sound premise is whether the military is portrayed realistically. Strub admitted that whether a movie portrays the military realistically or not depends on the context of the movie. Strub and the Defense Department won’t support scripts that present negative portrayals of the U.S. military or its chain of command. If you see a film or TV show where service members are taking orders from political aides or fictional intelligence agencies, Strub and the Pentagon are probably not involved with the project. Director Michael Bay films on the set of the movie “Transformers” at Holloman Air Force Base, New Mexico, in 2006. For instance, Marvel’s “The Avengers” presented an insurmountable issue that caused the Pentagon to say, “Thanks, but no thanks.” It was the premise of S.H.I.E.L.D., a fictional, international peacekeeping organization, and the question of how the U.S. military fit into the story line—as an oversight entity or answering to the organization—that caused the roadblock. While the service members in “Transformers” reported to the military, S.H.I.E.L.D., according to the script, operated its own program with no military oversight. Even in a fictional world, the Pentagon couldn’t find a mutually agreeable resolution. A fair amount of disagreement is inevitable as each side protects its interests, so it’s no surprise that issues over dialogue are common. Strub, who occasionally observes from the sidelines of TV and movie sets, also serves as a consultant and has had his fair share of wordsmithing jousts. One particular disagreement during the filming of an “Iron Man” movie stands out. In the script, one military officer told another that people would “kill themselves for the opportunities he has.” Strub said he didn’t like the line and made recommendations. It was no shock the director didn’t like the suggestion. “It never got resolved until we were in the middle of filming,” Strub said. “Now we’re on the flight lines at Edwards Air Force Base (California), and there’s 200 people, and [the director] and I are having an argument about this. He’s getting redder and redder in the face and I’m getting just as annoyed. Lieutenant Colonel David Coppler shows actor Terrence Howard how to use the controls of an F-16 Fighting Falcon simulator to help prepare him for his role in the movie “Iron Man” at Edwards Air Force Base, California, in 2009. Access is the primary reason a director would adjust a script or premise of a movie. Strub said that’s the reason the military unit in Transformers had one airman. The filmmakers wanted to shoot on air bases, but the Air Force wasn’t necessarily inclined to let a film featuring a bunch of soldiers use its facilities. At least not until Strub suggested adding an airman to the mix. Would it happen in real life? Maybe, maybe not. But it was plausible and everyone involved was happy with the solution. With the recent surge in the popularity of military movies, it seems logical the military would see an uptick in recruiting numbers. But Strub said there’s no concrete evidence to support the theory. Even recruiters’ claims of increased recruiting numbers after the 1986 release of “Top Gun” can’t be substantiated. I think that’s more the way these things go once the filmmakers understand that we’re not out to undermine their art, but to try to come up with something that works for them,” Strub said. “Oftentimes … it’s something they haven’t thought of and they like it [and] it makes it better. And that happens all the time. But the movie might be one of the most memorable for its use of military equipment which, contrary to popular misconception, comes at a cost to filmmakers. A guide that factors in all the costs to operate each piece of equipment—including crew hours, because the equipment is always operated by service members—can be found with a quick Google search, Strub said. Like every rule, there are exceptions when the military can benefit from being part of the movie. If the filming presents a legitimate training opportunity for the military, then there’s generally no charge. “The thing is, … whether it’s legitimate training or not, isn’t necessarily an exact science,” Strub said, remembering working on a 1990s TV movie—“Vestige of Honor”—starring Gerald McRaney. The movie was about Vietnam-era veterans working to help a pro-American group trapped in Thailand after the Vietnam War. That kind of scenario—arranging for the incorporation of military equipment—is a rarity when it comes to the documentary, reality and game show filming requests, Evans said. Documentaries have some very rigid criteria to meet before getting the green light from Evans. There must be a tangible benefit to the DoD, he said. There has to be a distribution plan in place and the project has to have full funding. “The distribution and the funding are where they normally stumble,” he said. “They either haven’t got their distribution set up or they’re going to go out to film festivals. Evans has given the go-ahead to 115 of the nearly 120 requests for documentary support since the first of the year. And those numbers don’t include the requests the Los Angeles Entertainment Media office handles independently. While Evans does work with reality-type shows that want to feature service members, the majority of the projects focus on a specific topic and fit into the episodic category. Airmen work as movie extras on the set of “Transformers” at Holloman Air Force Base, New Mexico, in 2006. If all of this sounds like a dream job—hobnobbing with Hollywood royalty, influencing scripts and private previews of some of the biggest movies—Strub wants to set the record straight. To complicate matters, there’s no manual for Strub or Evans’ jobs. Their biggest asset to successfully doing their jobs likely lies in their backgrounds. He earned his master’s in cinema production from the University of Southern California, but mostly worked on smaller pictures in a technical capacity. He’s been shepherding Hollywood’s military movies in his current position since 1989. Evans has no formal film production training, but he also served in the Navy, where he trained as a broadcaster. He retired as a chief petty officer with more than 21 years of service and worked as a defense contractor until taking a job with the DoD’s Community Relations office 13 years ago. He has served as the deputy director of Entertainment Media for more than a year. If you’re waiting for a movie about Strub and Evans to hit theaters, it’ll likely be a long wait. While Strub’s name occasionally appears in movies credits, both men shun the limelight, often politely declining individual credit. –Samantha L. Quigley is the editor in chief of On Patrol. This story originally appeared in the Winter 2015-16 issue of On Patrol, the magazine of the USO. In the past few years, 550 cord bracelets -- which are crafted from parachute cord -- have gained popularity, creating a demand for bracelet-making classes at USO centers around the world.